Growing two or three different types of plants together within a confined or designated garden space is the practice of companion gardening. Each plant contributes to the benefit of the others. This practice provides an organic method of pest and disease control, and increases yields in your vegetable garden. The traditional trio of corn, bean and squash plants is referred to as three sisters, so named within the Native American culture. Beans fix nitrogen in soil and corn requires a considerable amount of nitrogen to grow. The corn also provides the bean with support, as the beans use the corn stalk as a trellis. 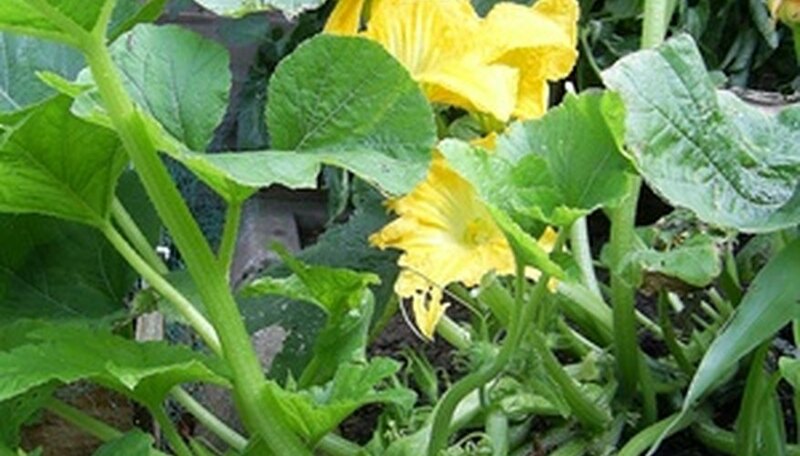 The squash, with its large, fan-like leaves, keeps the soil cool and moist, protecting the delicate root systems from the summer’s heat. Tomato, basil and garlic together make a tasty pasta sauce. Grow them together in your garden as well. Garlic repels aphids, beetles, snails and a host of other pests. Plant the bulbs close to the stem of the tomato plant. Plant the basil a bit further away, as it requires space to grow outward as well as upward. The basil plant wards of spider mites and aphids, and because it requires a different set of nutrients than the tomato, there is no competition for food. Okra is a fast-growing, sturdy plant that can reach heights of 6 feet. Plant okra with peppers and lettuce. Plant the okra so the large plant provides shade for the lettuce, which prefers cooler temperatures. Place your pepper plants downwind of the okra, and the okra plant will act as a windbreak for the delicately stemmed pepper plants. Sunflowers are lovely to look at, but they are also a tough plant. Use them as a trap plant for aphids. Aphids are attracted to sunflowers, and when these flowers are present in your garden, the aphids will ignore your tomato and pepper plants and instead attack the sunflower stalks. Sunflowers will also attract hummingbirds to your garden. The hummingbirds will eat any whiteflies that happen upon your garden, looking to decimate your tomato and pepper plants. Marigolds ward off aphids, whiteflies, nematodes and squash bugs, among other pests, making it beneficial to most vegetable plants. Exceptions to this are beans and cabbage. Marigolds give off a secretion most pests abhor. This same secretion has a negative effect on the growth of both beans and cabbage plants, preventing them from establishing strong root systems, effectively choking off their food uptake system. Plant marigolds at the corners of your garden beds are along the garden borders. Not only do they provide pest control, they also attract beneficial insects such as lacewings and parasitic wasps.